Nowadays more and more couples have their wedding also documented in the form of a film. And you want your Bali wedding video to be perfect, don’t you ? Ladies, like it or not - there is a clear trend: your Bali wedding video is not complete without drone / aerial video footage. With its dramatic shoreline and the truly captivating scenery drone video will the crowning jewel for your spectacular wedding film. That is if you have a great drone pilot and not one of the countless wannabes. 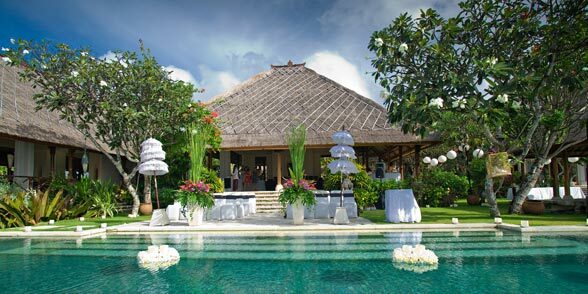 In this article I will share a few things you should pay attention to when choosing a Bali videographer. Especially one that also provides a Bali drone video documentation. A Bali drone video looks best if it is included in videos that are filmed in wedding cinematography style. Wedding cinematography style is one that relies on the same techniques as for a high-end documentary or a movie. It requires a skilled director who plans the shots and sequences to be included in the video. And equally important is a cinematographic editing style. All this is kinda hard to describe guys… Think of it like your Bali wedding video created in the style of a great documentary as shown on National Geographic or Discovery channel. Dramatic camera motions, cameras moving as opposed to statically mounted on a tripod. Multiple cameras filming from different perspectives at the same time… and much more. And of course those spectacular aerial shots. There are a handful of companies in Bali that include Bali drone video in their wedding documentation. But some are either overpriced or create videos that may not meet your expectations. Often the drone parts are nice but the remainder is rather amateurish. 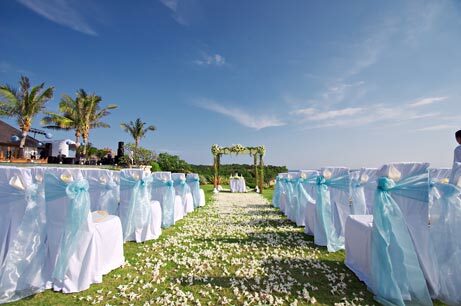 For instance, many video companies in Bali are not good at recording the words spoken during a wedding. 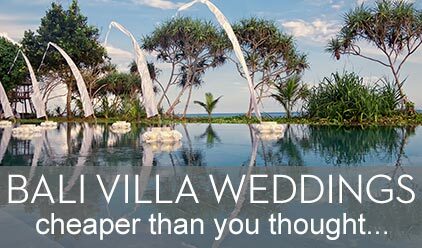 Which is a pity because if well done the vows or other things said during the wedding can make a Bali wedding video much more emotionally engaging. Asking your wedding planner may not be the right way either because almost all wedding companies make their recommendation not based on what is best for you but based on who pays them the highest commissions. Referral fees or kickbacks as I prefer to call it. 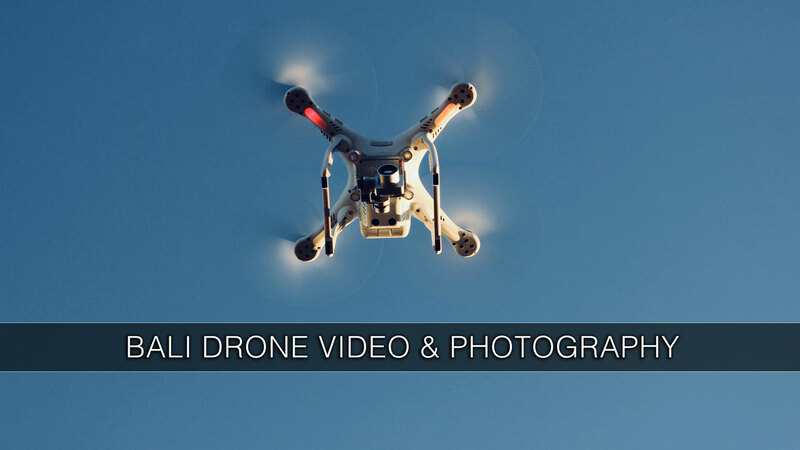 Another aspect that makes finding the right videographer with Bali drone video footage a bit complicated is that for a video company simply buying a drone and have it fly above you is not enough. For a good Bali drone video, it is very important that the camera is operated by an experienced drone pilot. One who has enough flying hours and knows the angles and perspectives that work best for a Bali drone video. Would you like to sit in a plane with a pilot who has no experience and hardly any flying hours… Would you ? One videographer who always delivers stunning wedding films is VALENTINO RUYA - Bali Wedding Cinematography. His Bali drone videos never fail to amaze. Besides the drone footage, his videos are also masterpieces in the art of storytelling. Because his videos are always directed, filmed and edited in true wedding cinematography style. A Bali drone video combined with wedding cinematography… it can’t get any better than this. I have good news for you bides and grooms. While Valentino’s services are not cheap they are still affordable, considering what goes into creating such a video. Recently I sat down with VALENTINO RUYA over coffee and I had the opportunity to ask him a few questions about Bali drone videos. Some of the answers may surprise you - so read on. Question: How do you go about creating wedding videos with drone footage ? Valentino: First and foremost, I rely on an experienced drone operator. Because flying a drone is a bit similar to flying a plane. It requires a pilot with many flying hours. Someone who knows his craft. Secondly, it is especially important to always use the best possible drone equipment. Many Bali drone videos are made with cheap drones and low-quality cameras. My drone pilot and I do not make any compromises when it comes to state-of-the-art equipment. Question: How did you learn to make Bali drone videos ? Valentino: After I bought my first drone I crashed it several times. I quickly realized that I was not born to fly… And I feel extremely lucky that during a wedding back in 2015 I met Bali’s best drone pilot. After seeing how he flies and his footage I was hooked… Ever since I would never, ever want to work with any other drone pilot in Bali. Question: Is there something a couple can and should do when preparing to have their wedding video include filming by drone ? Valentino: Actually, not much. One thing sometimes couples fail to do is: Ask if the wedding venue of their choice allows drones to be used on the premises. Because unfortunately, more and more hotels in Bali do not allow drones. The other thing I would like to tell couples and their audiences is not to look up to the drone at any time. Just ignore it. Question: You say your wedding video services are WEDDING CINEMATOGRAPHY. Can you explain what that means ? Valentino: For my couples it means a video done in the same way as a documentary film to be shown on National Geographic. A combination of impressive video sequences combined with all that goes into great storytelling. And I want my wedding films to create a strong emotional response in viewers. Question: How many Bali drone videos has your company done ? Valentino: Mmmmh… I don’t remember the exact number, but it must be over 25, possibly 30 or more. Question: How much does it cost to have a drone included in a video package ? Valentino: 200 USD – 300 USD depending on how long the drone pilot is present on the venue. Question: Are there any venues that are better suited for a drone video than others. Valentino: A villa wedding or a wedding on the beach is generally better than a crowded hotel. But that is exactly where a good drone pilot comes in. A good drone pilot can create good footage at any venue. Question: Any final advice you would like to give to couples who want a wedding documentation with drone video ? Valentino: Ask your videographer if he brings a backup drone. Because drones can fail. You would not want to hear the excuse: Sorry, we have no drone footage because there was a problem with the drone during your wedding. Well, ladies and gents there you have it. I hope you have found this article useful and you are now better informed how to choose a good videographer who includes a Bali drone video when filming your big day. If you want a quote for such a spectacular drone video please press the button below and receive a quote.